Studies say that men are more likely to partner-up to run a venture whereas women tend to strike out alone. As a successful female partnership, we wanted to stake up exactly why we think the female co-founder setup can work. To give you some background, my path crossed with Emma Hatto, my now Co-Founder of both BOWER and ibLE, while we were both working as PAs within a sovereign wealth fund. We were only there together for a year but formed a great friendship and after a few years and several jobs later, during a long conversation over dinner about the frustrations of not knowing where to go next in our career, we came up with an idea. The idea was to create a specialist talent company focused on the recruitment, training and development of PAs, EAs, Office Management and other support staff for interesting companies that saw the value in having excellent people in their businesses. We were immensely frustrated with the quality of recruiters we had encountered as both candidates and clients and the little value they added to what could be an expensive process. The idea also resonated with both of us was because we’d come from an EA background. Which meant, unlike some recruitment agencies, we knew exactly what it was like to look for a job in that sector and also what employers there were looking for. This gave us a natural empathy with both areas and made our candidates of equal importance as our clients. Which leads me to the first point of why an all-female co foundership felt right to us. Empathy is a trait that studies attribute most highly to those who identify with a female gender. Recent poignant studies also attribute empathy to success. Do you see where I’m going with this? Yes, we could, of course, have found a male co-founder who could emphasise just as well but we both knew this was one area we had nailed down. Many successful female entrepreneurs also mention how less likely it is for women to support other women in the workplace, despite the progress this would ensure of more women rising up the ranks. Well, not in our ranks it won’t. Something which isn’t often addressed is why women have a history of competing rather than supporting each other in a corporate situation. First, it’s grounded in evolution. Modern society is so far from the Neanderthal days where women needed to secure a male companion in order to procreate and therefore, ensure survival, but the basic evolutionary instinct for competition has not left. Fast-forward, oh I don’t know, nearly two-million years and we have much more modern conundrums like quotas. The portion of all Fortune 500 company board seats held by women in 2017 was just 22.2%. When you think about the stats, it’s no wonder women are programmed to compete in the workplace. A handful of jobs is always going to create more demand than security. Which is why when you choose a female co-founder you’re given the freedom to make your own rules. To question what might happen if you’re allowed to support rather than compete, to help, rather than shut-down. Emma and I began our culture of mutual support whilst still working at our sovereign wealth fund, an extremely tough, male-dominated environment where it would have been easier, and perhaps more natural, to have competed rather than supported each other. The foundation we built there is the absolute core of our relationship as co-founders. 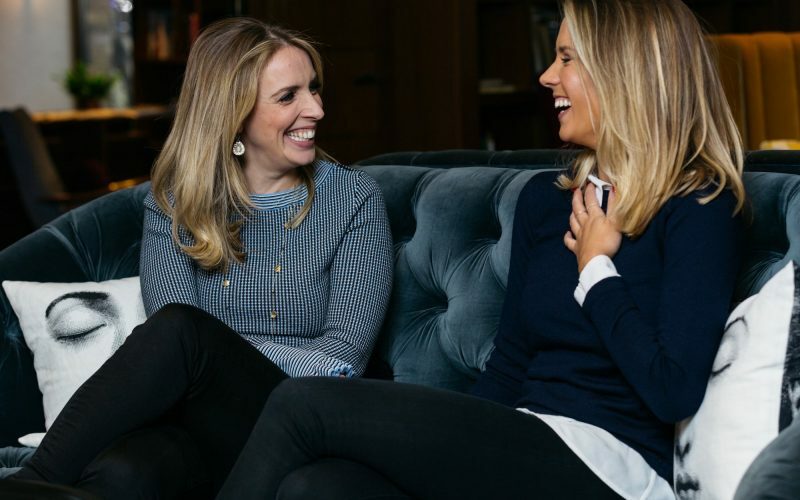 We are fully supportive of each other and use our strengths to form a pretty amazing way of building and growing a company and taking other women along with us. It is a highly valued and powerful bond. This gives us two different perspectives and methods but also means we complement each other nicely. Where one of us might be occupied, the other one is available. We’re able to manage early starts and late nights and a shared workload makes for a much happier and healthier approach to work and life. We share and support each other’s difficulties (e.g. lack of sleep for me, missed flights for Emma…). It’s like a marriage. And to make it successful there has to be an element of unconditional support and championing of the other party, through tough times as well and through success and growth. Say yes to the female co-founder! So next time you get that delicious fizz of a new idea, consider first if you want a co-founder (I’d highly recommend it) and secondly, why that co-founder might well be female. What are your experiences with finding or suggesting a female co-founder? I’d be keen to get your thoughts. Next Post:What does “Virtual PA” really mean?